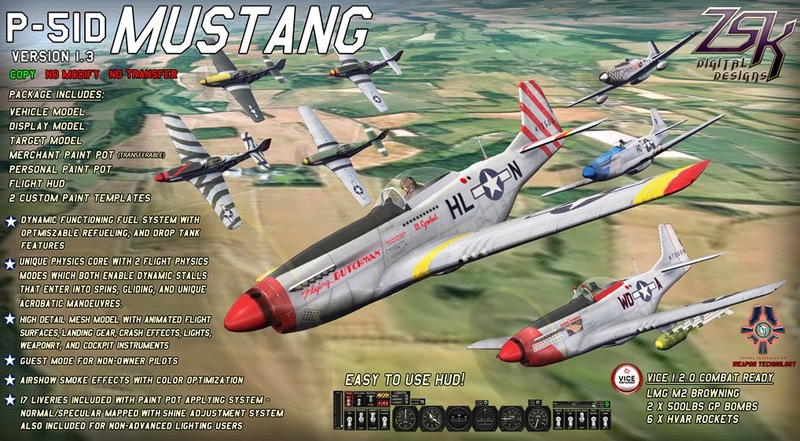 ZSK Digital Designs: P-51D Mustang update 1.3 launch! P-51D Mustang update 1.3 launch! - Mode B and A; Two different Physics modes! Use command "mode" or use the HUD button to change physics modes. ~ Aircraft will enter into a spin when stalling. ~ Plane will stop faster and pitch forward more if braking heavily. > Airshow smoke on the wing tips. Preset colors are available in the Mustang's drop down menu. Additionally, you can type in color, ltip or rtip with a vector color <R,G,B> to change either tip to a custom color. > Improved Camera function. You now have a Taxi cam and Flight cam which work automatically depending on your aircraft's speed. Flight cam is positioned right behind the tail and is perfect for dog fighting. Taxi cam has the camera on top of the tail just like the original camera that's in the current P-51. > Real time realistic refueling. Not only will you be able to refuel your aircraft with a custom set amount of fuel, but you will also see it being loaded/unloaded in real time (which is about 6 Gals. per second.). > Radiator door function. You can now open and close the Radiator door via the hud or "rad" command. > P-51D Merchant Paint Pot. This new paint pot is Transferable and reads textures UUIDs from a Notecard. Ideal for trading custom paint jobs. > New command "harness" for people who'd like to show their seat harness during flight. > Canopy mounted Mirrors. Just type in "cm" to toggle them. > Hover text bug. Fuel wouldn't display correctly unless the text feature was cycled. Hover text now displays MPH and m/s. > Auto level bug. The Aircraft will now level out it's wings without problems. > Renamed <ZSK> Custom Paint tin to <ZSK> Personal Paint Pot to lessen confusion between the new Merchant Paint Pot. > Seatbelt will not automatically strap your Avatar into the plane. Use the new command "harness" to strap in. > New Rudder mesh with improved UV mapping and tail light. > New Propeller mesh with improved UV map, textures, and with Normal and Specular maps. > Removed Mouselook Animation Overrider due to script errors during sim crossings.